This is a guest post by an American artist who has an interest in nonwestern art but prefers to remain anonymous. I asked him to share some of his work with us. 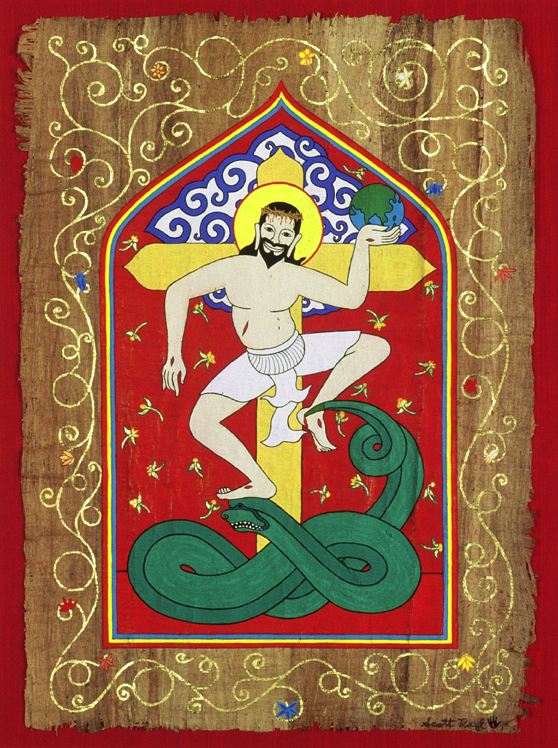 Dancing Jesus, 2003. Acrylic on brown papyrus, 12 x 8.75 in. 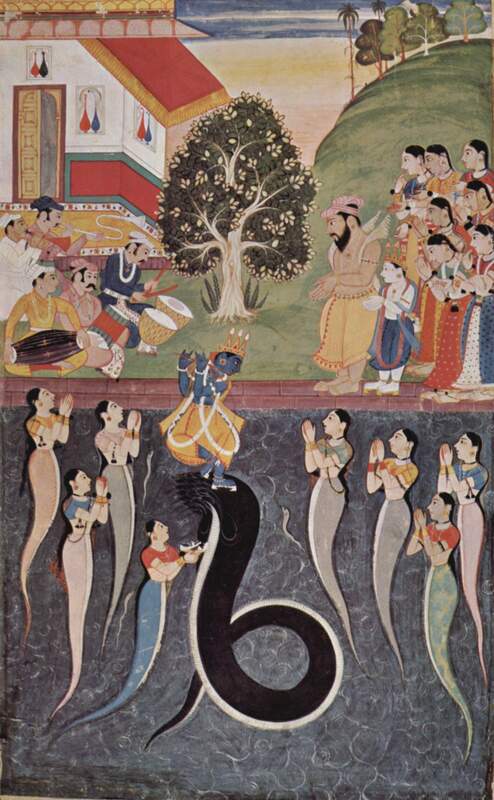 Krishna dances over the subdued Kaliya Naag in river Yamuna. From a Bhagavata Purana manuscript, c. 1640. This painting is primarily a visual experiment based on South Asian Hindu art and Tibetan Buddhist thangkas. 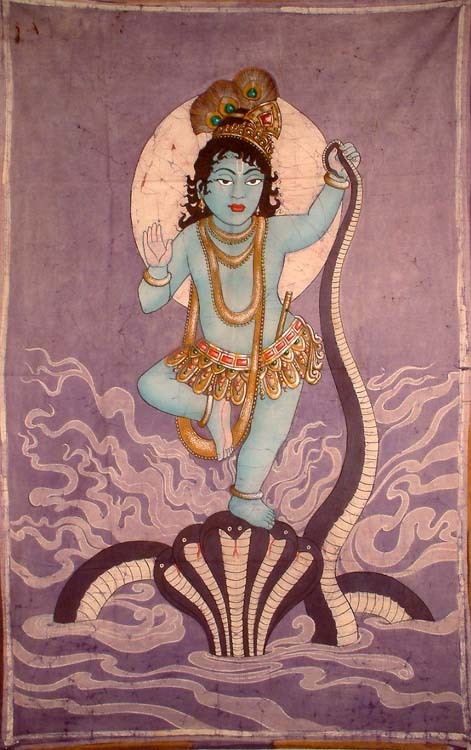 Jesus is dancing on (crushing) the head of Eden’s serpent (Genesis 3:15), much as Krishna does on the serpent Kaliya. The body position of Jesus is derived from temple carvings at Angkor Wat in Cambodia, while his face is based on the site’s monumental smiling faces. Apsaras. 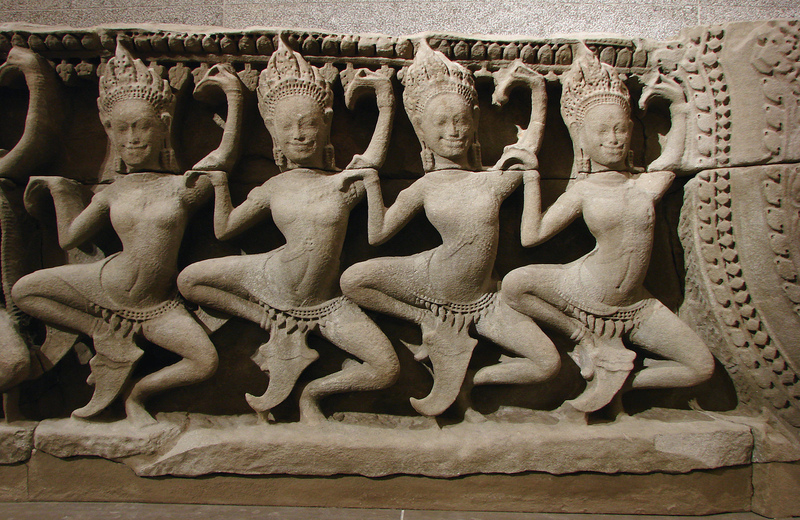 Detail of a lower pediment from the Angkor Wat complex in Siem Reap, Cambodia, c. 1200, on display in the Guimet Museum, Paris. Smiling faces. Angkor Wat complex, Siem Reap, Cambodia. In the painting, Jesus holds up the world, which he saves from the power of Satan, who simultaneously pierces his heel. The cross behind them represents the method of Jesus’ victory, while the cloud represents God the Father. The flowers in the background represent blessings falling from heaven. Jesus’ right hand is positioned loosely in the Bhumi-sparsha mudra (“gesture of touching the earth”). This mudra was used by Siddhartha Gautama to cause the earth to bear witness to his achievement of enlightenment. Here I am using it to symbolize the earth’s witness to Jesus’ lordship over heaven and earth. Mayan Resurrection, 2009. Acrylic on bark paper, 17 x 8.75 in. 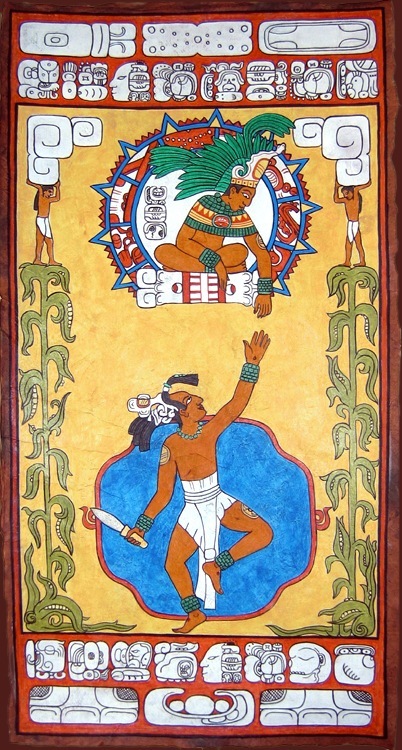 This painting is an ancient-Mayan-style image of the resurrected Jesus dancing out of his tomb. 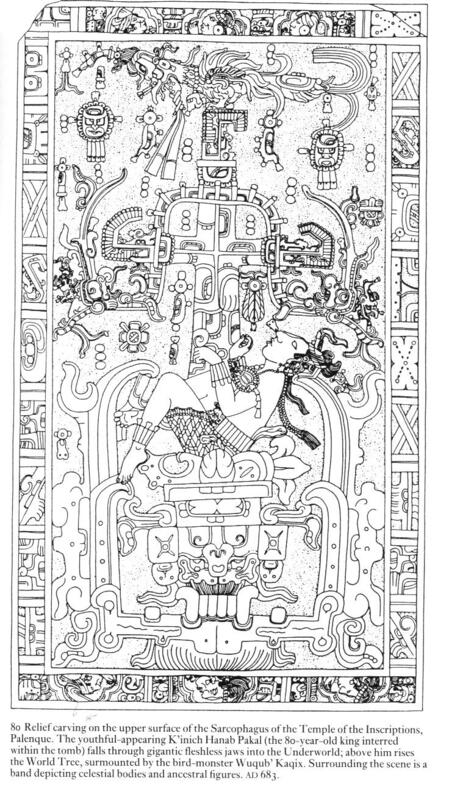 I created the image in response to a seventh-century carving I came across in my studies (shown above); found on a Mayan king’s sarcophagus lid, the carving depicts the king falling (literally) into the jaws of the underworld at the moment of death. I wanted to create a response that shows the love and hope offered in Christ’s resurrection and triumph over death. In my painting, Jesus is reaching up to God the Father, who is calling him out of the tomb from his throne in heaven. The ancient Maya believed that at the time of death, the soul entered a multilevel underworld known as Xibalba. There the soul would be tested by the Gods of Death, reenacting a confrontation originally fought by two mythical Hero Twins. Through their victory over death, these twins were able to resurrect their deceased father, the Maize God, from an opening in the earth. Mayan kings would reenact this triumphant story by performing a dance that represented the emergence of the resurrected Maize God out of the underworld. I have based this image of Jesus on a similar dance performance as the literal God-Man who died, and by so doing defeated the true god of death, Satan. Afterwards, he returned to the land of the living in a dance of triumphant joy (Hebrews 12:2). In ancient Mayan culture the color blue symbolized the waters of Xibalba, and therefore death itself; I used this color for the inside of the tomb. As he dances, Jesus holds a flint knife in his right hand. This is a reference to the Hero Twins who, while being tested by the Gods of Death, defeated them by decapitation with a flint knife. The corn stalks on each side represent resurrection (by association with the Maize God), though the Mayan concept is somewhat different from the Christian meaning. Two angels stand on top of each stalk supporting the cloud/glory that surrounds God the Father on his heavenly throne. There seems to be a disconnect between ancient art and the twentieth-first-century Mayan. If Mayans of fifteen centuries ago saw your portrayals, they might have made some sense of it. By analogy, most British moderns, if taken to Stonehenge, would not relate to it. They’d need a specialist explain to them what they were seeing. So, this painting would probably not make an impact on most contemporary Maya, or be embraced by Mayan evangelicals. But nevertheless, it has been for me a good theoretical exercise in visual contextualization. 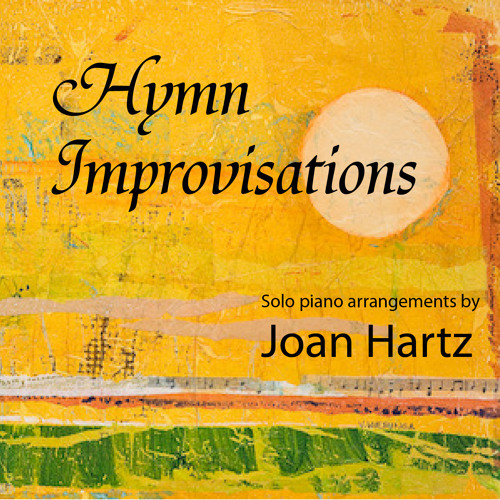 In a real-life missions context, however, any type of contextualized art form would require multiple reviews by locals (both believers and nonbelievers) before being used in a wider context. This entry was posted in Non-Western Art, Theology and tagged dancing apsaras, krishna and kaliya, mayan maize god, smiling faces of angkor, visual contextualization. Bookmark the permalink. I have a drawing or something like it, it has a stamped seal. registero no.28 copyright 1969 Patric hecho en Mexico. I can’t seem to find the artist. I’m saddened this artist prefers to remain anonymous , his work is engaging and I would like to see more.I am particularly drawn to the “Mayan Resurrection”. I too am an artist who works with an emphasis on resurrection themes, the Popol Vuh is a frequent inspiration. I was impressed by this composition and its referencing what I suppose is sarcophagus lid of king Pakal btw ,.the link provided does not function). This artist understands the Maya and their art , this interpretation ample proof . I hadn’t known that blue was the color of Xibalba, I am aware of the distinctive “Maya blue” found on pottery but its association with the Underworld was new info , thank you. If the artist is interested I would appreciate the chance to chat about our mutual interests, my studio journal is: http://www.boondocksbabylon.com. Thank you for a great site, i will add the Jesus question to my blogroll. I’m glad you enjoyed the post. I will pass on your contact information to the artist. I will also look into finding an alternative image of the sarcophagus lid to replace the now defunct one.